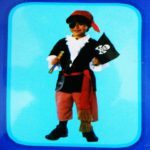 Ever since young Junior, here, first read about pirate ships, it’s been all you can do to keep him from running off to join a band of boat-loving brethren on the high seas. Just what you needed, eh? Lucky for you, there is an ideal way for your little one to live out his dreams without even leaving the neighborhood to plunder and pillage (and...miss school!) 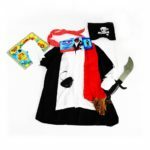 This Kids Pirate Mate Costume is about as authentic as it can get. Your little matey will no doubt have a fun time making scallywaggers swab the deck, searching for chests of treasure, and embracing his fantasy life out on the ocean! He can put this costume on and pour over books on pirate’s code, or he can wear it to walk around the neighborhood pool and direct his “crew” to walk the plank into shark infested waters. Either way, he’ll be jolly and he’ll be home safe by dark; win-win! Also makes a great fancy dress costume for fancy dress competitions.